Feature image: A selection of angiosperms. 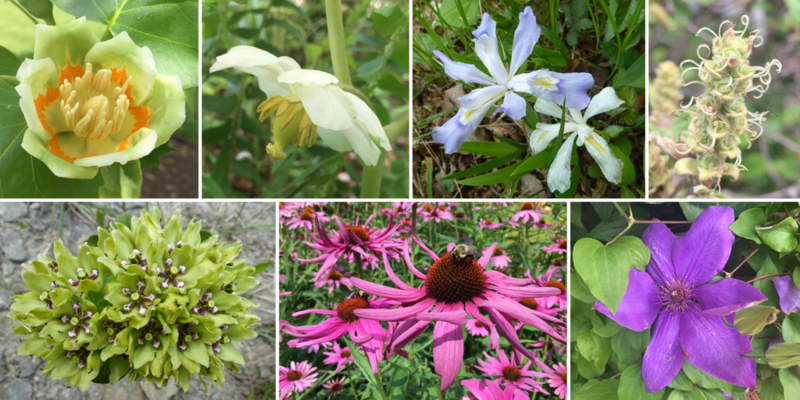 Top row, from left to right: Tulip poplar (Liriodendron tulipfera), mayapple (Podophyllum peltatum), dwarf lake iris (Iris lacustris), and winter hazel (Fothergilla). Bottom row: Green milkweed (Asclepias viridis), echinacea (Echinacea), and clematis (Clematis). All images by E.J. Hermsen (DEAL). Angiosperms, or the flowering plants, are without doubt the most diverse group of modern plants. There may be over 290,000 species of angiosperms alive today, and they are thought to make up about 90% of the world's living embryophyte species (see here). Angiosperms are highly variable in form. They include herbs, shrubs, trees, vines, and succulents. They occur in a great many habitats, from forests, grasslands, and deserts, to aquatic and marine environments. Angiosperm diversity. Left: Bluets (Houstonia), small herbs growing in the eastern North American forest. Second from left: Manzanita (Arctostaphylos), a small tree growing in an arid region of California, U.S.A. Third from left: Bittersweet (Celastrus), a vine. Right: Sacred lotus (Nelumbo nucifera), an aquatic plant. Credits: Manzanita by E.J. Hermsen & J.R. Hendricks (DEAL); bluets, bittersweet, and sacred lotus by E.J. Hermsen (DEAL). Angiosperms include amongst the world's tallest, oldest, and most massive plants. Centurion, a mountain ash (Eucalyptus regnans) growing in Tasmania, is the second tallest living tree measured, at about 100 m (328 ft) in height (read more about the tallest angiosperms here). Pando, or the Trembling Giant, a clonal quaking aspen (Populus tremuloides) in Utah, U.S.A., is thought to have been growing continuously for up to 14,000 years and covers over 100 acres (40 hectares) of land (read more here). It is one of the most massive organisms alive! On the other end of the spectrum, many angiosperms are small annual plants whose lives span only a single growing season. Watermeal (Wolffia), an aquatic angiosperm up to 2 mm long, is the smallest angiosperm. Superlative angiosperms. Left: Centurion, an Australian mountain ash (Eucalyptus regnans) that is the second-tallest tree in the world. Center: Stems of Pando, a quaking aspen (Populus tremuloides) that has been producing new shoots for up to 14,000 years. Right: Watermeal (Wolffia), tiny aquatic plants. Credits: Eucalyptus regnans/Centurion (Eucalyptus99, via Wikimedia Commons, CC BY-SA 4.0); Populus tremuloides/Pando (Scott Catron, via Wikimedia Commons, CC BY-SA 3.0); Wolffia columbiana ss Fischer et al. EfÖLS 2008 (Stefan.Iefnaer, via Wikimedia Commons, CC BY-SA 4.0). Images modified from originals. Angiosperms are of special interest to humans because they provide many essential and useful products, from food (cereals, fruits, vegetables), to tea, coffee, treats (e.g., table sugar, cocoa), medicines (e.g., quinine, digoxin), herbs (e.g., rosemary, oregano), spices (e.g., cinnamon, nutmeg), oils, fats, natural rubber, wood, clothing fibers (e.g., cotton, hemp, linen), and other products. Their relationships with people are not always beneficial. Some angiosperms are agricultural weeds or invasive pests that blight natural areas. Others are the sources of potent and dangerous poisons (e.g, strychnine) or drugs that are abused (e.g., morphine from the opium poppy is used to make heroin, and cocaine is an alkaloid from the coca plant). Economically important plants. Left: Black emmer wheat (Triticum dicoccum var. atratum). Right: Coffee cherries (Coffea arabica). Credits: Triticum dicoccum (Robert Flogaus-Faust, via Wikimedia Commons, CC BY-SA 4.0); Coffea arabica 'Nazareth' (Krzysztof Ziarnek, Kenraiz, via Wikimedia Commons, CC BY-SA 4.0). Images modified from originals. Angiosperms show many different modifications and adaptations for defense, support, procuring nutrition, and living in challenging environments. Some are armed with prickles, spines, or thorns, or have tendrils for climbing. Some are carnivorous, employing methods—such as pitfall traps, sticky traps, and snap traps—to ensnare their prey. Others are parasitic, deriving nutrition from host plants. Carnivores and parasites. 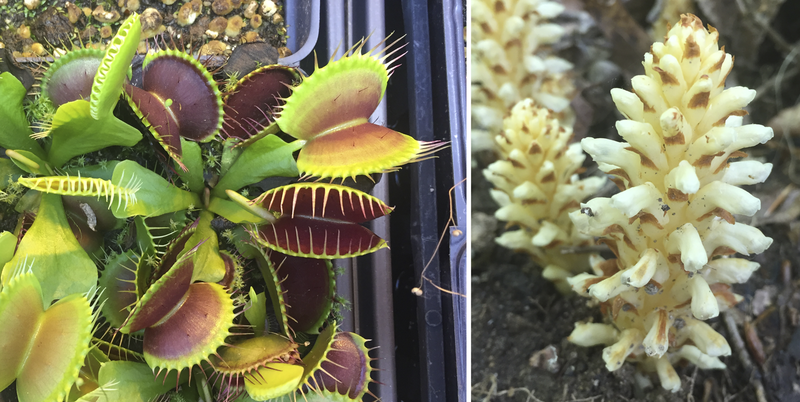 Left: Venus flytrap (Dionaea muscipula) is one of only two species of angiosperms with snap-traps for catching prey. So-called "carnivorous" plants capture prey in order to get essential nutrients, like nitrogen. Right: American cancer-root (Conopholis americana) parasitizes oaks (Quercus). Credits: Images by E.J. Hermsen (DEAL). The reproductive structures and life cycle innovations of angiosperms readily set them apart from other groups of plants. The reproductive structure of angiosperms is the flower. While a flower can be considered a type of strobilus, or cone, angiosperm flowers have some obvious differences from cones found in other groups of plants. They often have colorful petals, and their pollen-producing structures are highly modified and called stamens. Perhaps most notably, however, their ovules are enclosed an ovary. When the ovary ripens, it become a fruit that encloses the seeds. In fact, the ovary or fruit is the feature to which the name "angiosperm" (Greek, angeion + sperma = container + seed) refers (in other words, angiosperm seeds are kept in a container). Although there are reports of pre-Cretaceous angiosperm fossils, the credible fossil record of the angiosperms begins in the Early Cretaceous. The stem group leading to the angiosperms could be far older. There is no general consensus regarding which gymnosperm group gave rise to the angiosperms. Angiosperms diversified during the Cretaceous period, and plants that show clear relationships to many modern flowering plant families can be identified in the fossil record by the Late Cretaceous. By the Cenozoic, many modern genera can be identified from fossil remains. In the last 66 million years, shifting continents, land bridges, and environmental changes shaped the diversity and geographic distributions of angiosperms as they occur today. Cretaceous and Paleogene angiosperm fossils. Left: A slab of leaves from the Upper Cretaceous Hell Creek Formation, western U.S.A. The leaf in the upper circle is from a member of the angiosperm family Trochodendraceae, whereas the leaf in the bottom circle is Erlingdorfia montana (Plantanaceae, plane-tree family). Leaves of other angiosperms and the extinct gymnosperm Nilssoniocladus also occur on the slab. Center and right: Leaves of sassafras (Sassafras hesperia) and alder (Alnus parvifolia) from the Eocene Republic flora (Klondike Mountain Formation, Washington, U.S.A.). Credits: Hell Creek leaves, U.S. National Museum of Natural History specimen USNM 606565 (E.J. Hermsen, DEAL); Sassafras hesperia and Alnus parviflora (SR 02-22-20) specimens from the Stonerose Interpretive Center, Republic, Washington, U.S.A. (Kevmin, via Wikimedia Commons, CC BY-SA 3.0). Evert, R.F., and S.E. Eichhorn. 2013. Raven Biology of Plants, 8th ed. W.H. Freeman and Co., New York, New York. Simpson, M.G. 2010. Plant Systematics, 2nd ed. Academic Press, Burlington, Massachusetts.